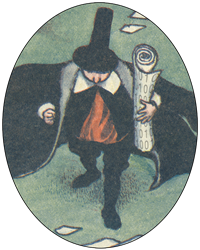 Abstract: In my talk, I will argue for a theoretically grounded approach to digital humanities. 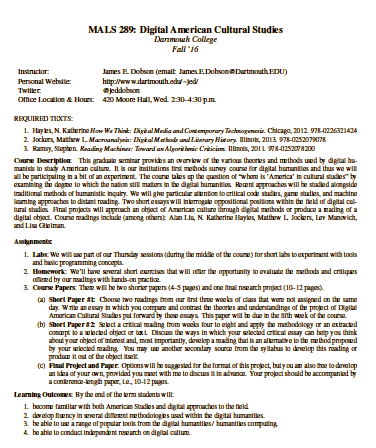 I teach a graduate (MA) level introduction to digital humanities course through American Studies. The American Studies frame enables us to ask questions about the nation and post-nationality that might otherwise be given short shrift in a digital humanities course. In taking up the question of where is “America” in the digital humanities, my course foregrounds both new and old debates over the selection of objects and methods. From an initial investigation of the field history of American Studies, we move into theoretical issues related to digital culture and reading. These oppositional readings provided the grounding for the remainder of the term, in which each week is organized around a particular topic area (Game Studies, Social Media, Databases, Critical Code Studies) that can be framed according to one of the earlier theoretical approaches. Two short papers compare methodologies and a final paper and project enable students to put the theory into practice and to theorize their own work. 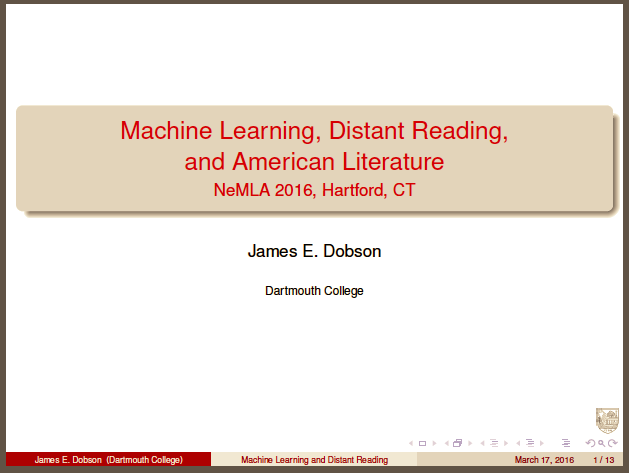 "Machine Learning, Distant Reading, and American Literature"
This session examines the prospects and pitfalls of bringing the teaching and reading of literature to the broader public through large-scale Internet-based platforms. Panelists introduce the idea of building learning communities around texts and the various critical reading practices that have been and might be used in these communities. Caroline Field Levander, Rice Univ. How and why might we scale learning opportunities up in the arts and humanities? How have instructors adapted new digital learning strategies for the residential classroom? Learn from Dartmouth faculty and those at peer institutions who have taught Massive Online Open Courses (MOOCs) in arts and humanities. Explore the impact of and potential for innovations in pedagogy and technology. Connect campus and community educators around questions of teaching in the 21st century. Benjamin Wiggins (University of Pennsylvania): "On Specialization(s): The Role of the Humanities in the Future of MOOCs"